Pancit Bihon is a Filipino dish that Chamorros adopted as their own, fusing ingredients from several cultures as well as using home-grown vegetables. There are many pancit variations. 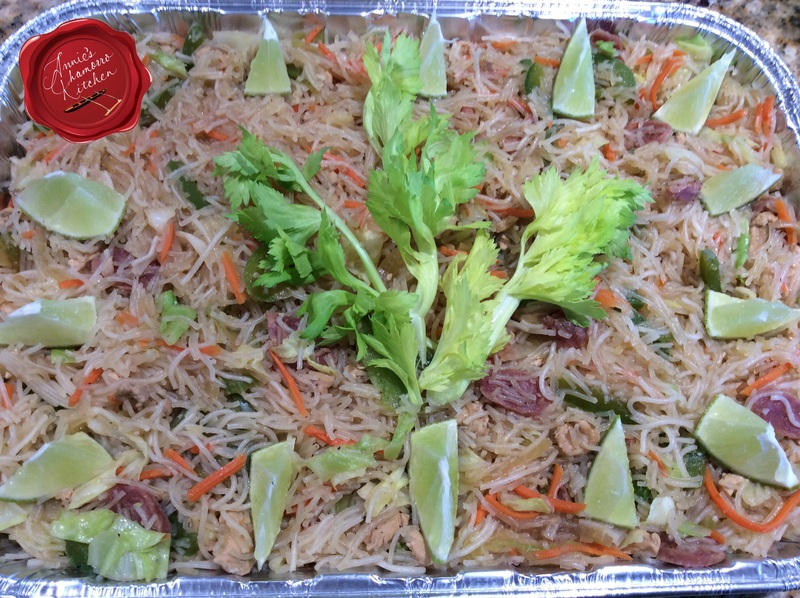 As the name implies, this pancit uses Bihon noodles, also called rice noodles or rice sticks. Bihon noodles are usually sold dried (that’s where the name “rice sticks” comes from) but some Asian markets sell them fresh. I used the dried noodles to make my pancit. It’s quick and easy — it only takes minutes to soften the dried noodles in a bowl of hot water, and even less time to cook them. I add a variety of vegetables to my pancit. It all depends on whatever is fresh and in season at the time I make it. I like cabbage, carrots, onions, celery, snow peas, bell peppers, and fresh green beans. In addition to vegetables, Pancit Bihon includes some sort of meat. I prefer using chicken in this recipe, but you most certainly can use pork and beef as well. Pancit Bihon also usually has Chinese sausage, which you can find in almost any Asian market. Look for sausage called “lap xuong mai que lo”. This is a cured pork sausage that resembles skinny pepperoni sticks. This is a great recipe that is simplified by doing a lot of the prep work ahead of time. If you’ve got a busy life that involves work, kids and school, then your time, like mine, is quite precious. 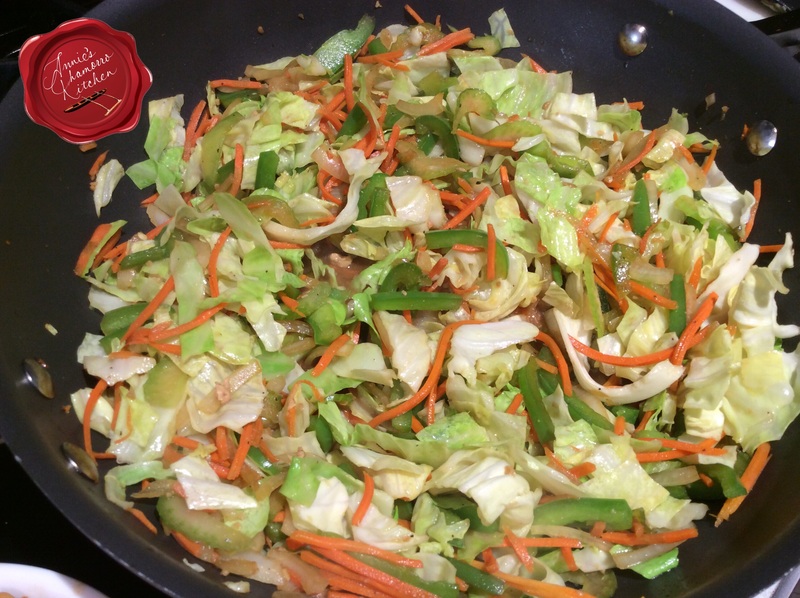 Cut your vegetables the night before you plan to make the pancit. You can also cut the meat ahead of time. Refrigerate the vegetables and meat until you’re ready to cook the pancit. When you’re ready to cook, all you need to do is soak the noodles, cook the meat and vegetables, then mix in the noodles. Easy peasy. 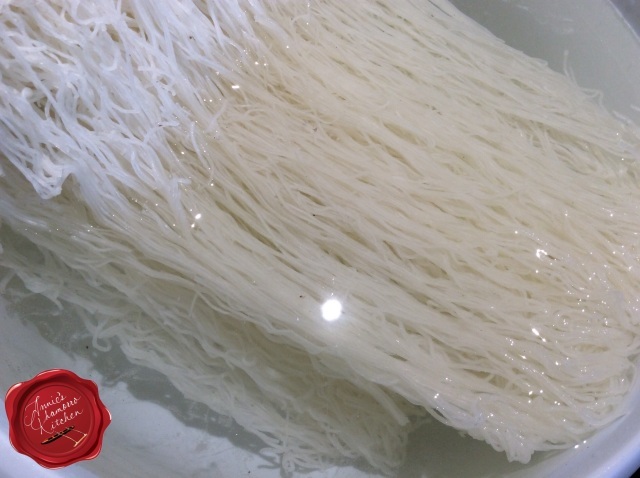 Place the dried rice noodles in a large bowl filled with hot water. Let the noodles soak while you cook the meat and vegetables. After the noodles become pliable, drain out the water. Use a pair of clean kitchen shears to cut the noodles in half. Set the noodles aside. 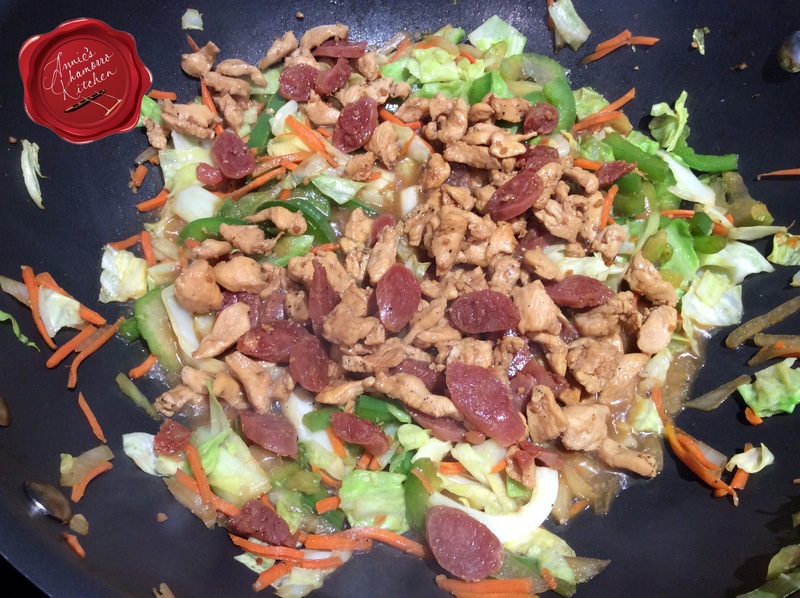 Saute the chicken in a large wok or pan along with garlic and black pepper. 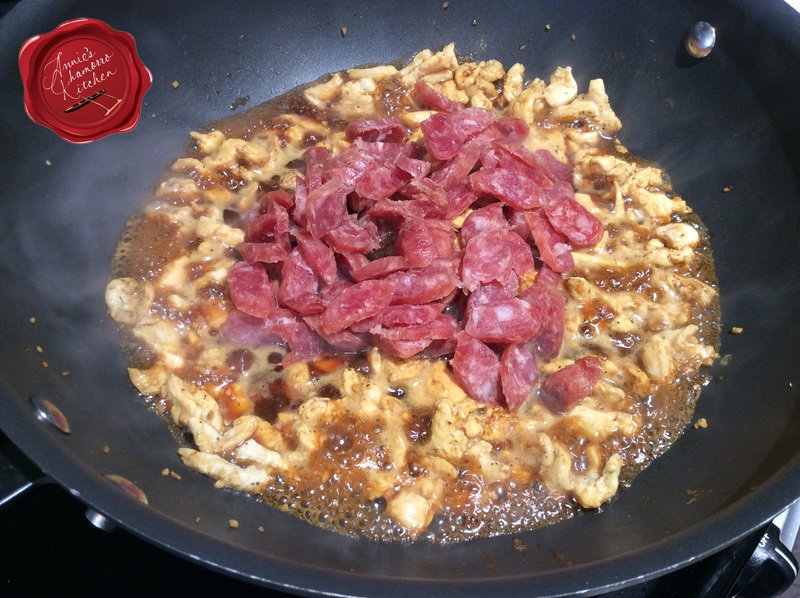 Once the chicken is no longer pink, add the soy sauce and Chinese sausage to the wok. Cook for another couple of minutes. Remove the chicken and sausage from the wok, leaving all of the liquid in the pot (you’ll use the liquid to steam the vegetables and finish cooking the noodles). Set the meat aside. 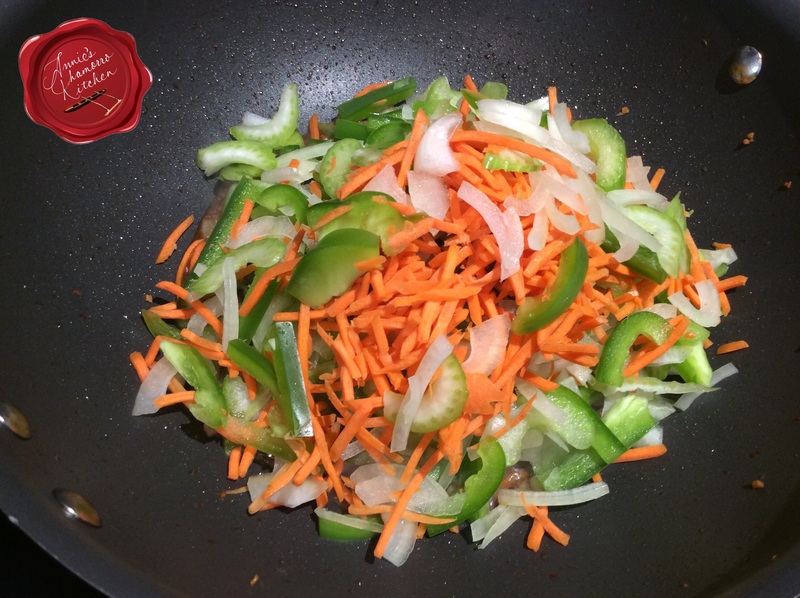 Add sliced onions, carrots, bell pepper and celery to the wok. Turn the heat up to medium-high. Stir fry the vegetables for a couple of minutes; do not cook too long — you want the vegetables to still be somewhat firm, not limp. 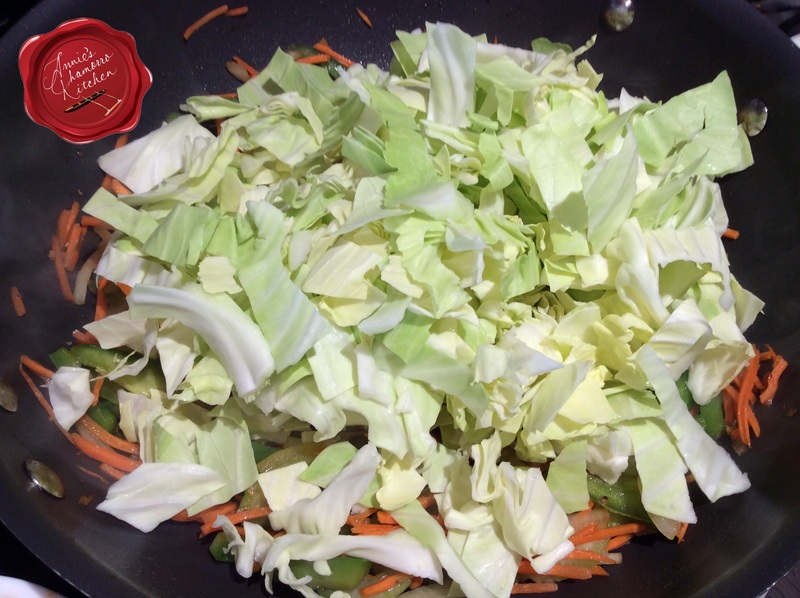 Add the cabbage to the wok. Cook for another couple of minutes, just until the cabbage begins to wilt. The liquid left behind in the wok steams the vegetables nicely. Remove half of the vegetable mixture (again, leave any liquid in the wok). Add half of the meat mixture back into the wok. Add half of the drained noodles to the meat and vegetable mixture. Stir to combine. Add the remaining vegetables, meat and noodles back into the wok. Stir once more. Taste and adjust the seasonings to your liking, adding more soy sauce or salt, to taste. Garnish with lime or lemon wedges. Serve with your favorite meal or as a main dish. ENJOY! 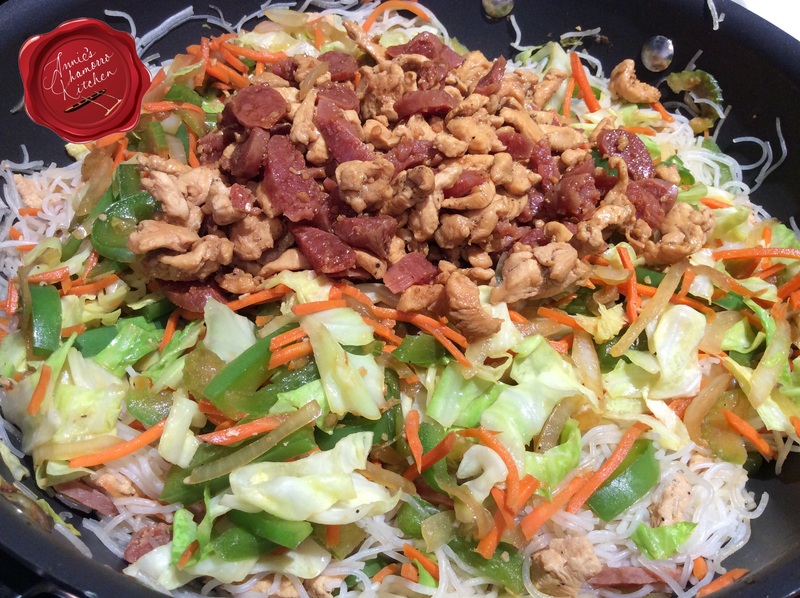 Rice noodles cooked with fresh vegetables, savory chicken and Chinese sausage. 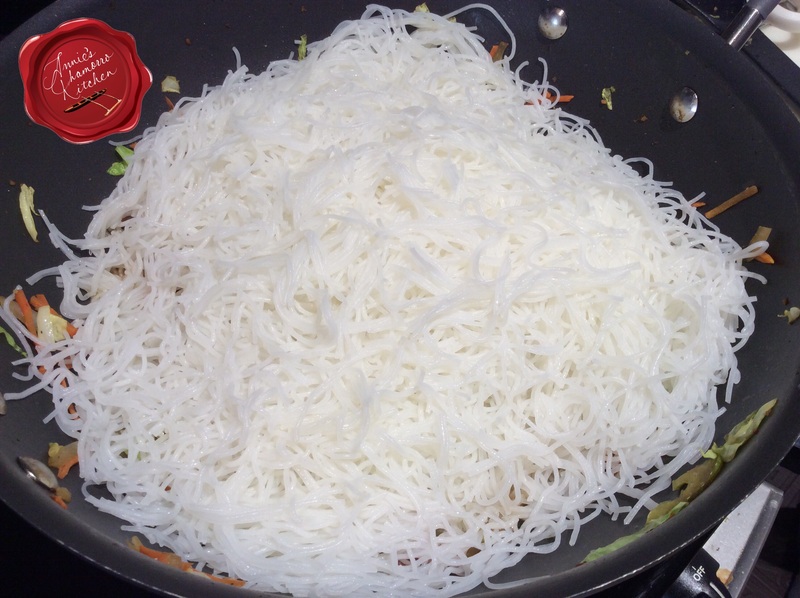 Soak the rice noodles in a bowl of hot water for 15 minutes. Drain the water once the noodles become pliable. Cut the noodles in half with a pair of kitchen shears. 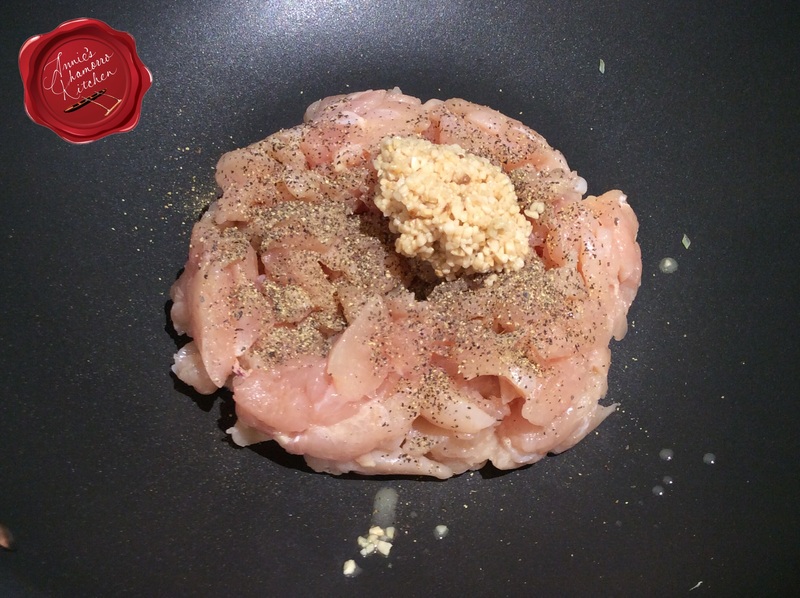 Saute the chicken, garlic and black pepper in large pot or wok; cook until the chicken is no longer pink. Add the soy sauce and Chinese sausage to the wok. Cook for a couple of minutes then remove the meat from the wok, leaving the liquid in the wok. Add the onions, carrots, bell pepper and celery to the wok. Cook the vegetables for a couple of minutes. Add the cabbage; cook until the cabbage wilts slightly. Remove half of the vegetable mixture from the pot. Add half of the meat mixture back to the wok, along with half of the noodles. Stir to combine. Add the remaining vegetables, meat and noodles to the work. Stir once more to combine. Cook for a couple of minutes then remove from the heat. Taste and adjust the seasonings to your liking, adding more soy sauce or salt if required. Garnish with lime wedges, serve and ENJOY! I was born in Guam, Agana went to school in Diddio I was nearly 12 years old when we left. My step dad was station at Anderson Air Force. I grew up with all the delicious food there. My mom always made chicken kelaguen she made the best. 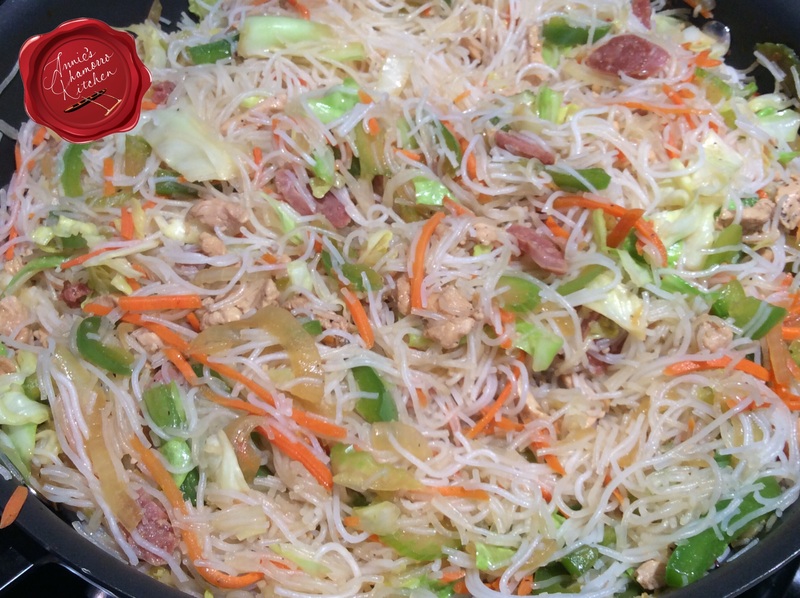 Now I would love to try your pancit, my son-in-law had some and it was his first time and he loved it. 50 years after leaving the island, pancit is still the food I would most like to eat again! Nothing I ate there I didn’t like. Hafa Adai, Joseph! 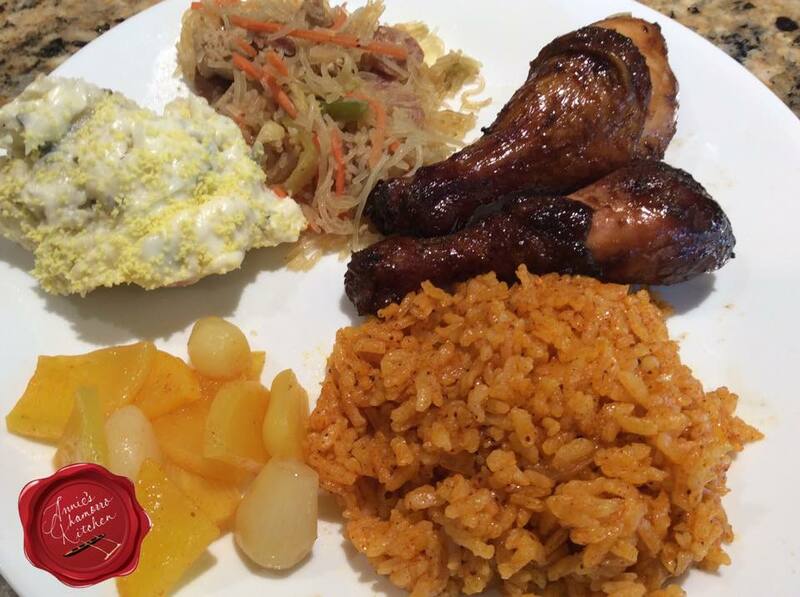 I hope you try making several of my Chamorro dishes. Stop by again and let me know how they turned out for you. You definitely do not have “tuba brain” 😀 You’re remembering Chicken Kelaguen, and great news…I have a recipe for that AND titiyas on my blog! Do a search for Chicken kelaguen and Flour Titiyas. Give them both a try. I loved living on Guam and eating red rice at fiestas. (1954/1956). My mother was a second grade teacher at Tamuning when my father was stationed at Andersen AFB. Do you have a recipe for red rice? I sure do have a red rice recipe. Look under Chamorro recipes or just type “red rice” in the search bar. Thank you so much for sharing your recipes. My family and I were stationed on Guam twice. In fact, I retired from the Navy on Guam. Our family loved the island. Our 3 sons didn’t want to leave. Somehow we found out about a place called the Chamorro Kitchen. For one of our family traditions, we would treat our guys to any meal or restaurant they desired on their birthdays. Our youngest always wanted to get a big order of Kimchee Pancit from the Chamorro Kitchen. We all went a little crazy over that meal. I saw your recipe for Kimchee Pancit and immediately contacted my son (in Denver, CO) who still has fond memories of island cuisine, and told him that, thanks to your posted recipe, I’m going to make a big batch of it (along with some of the other dishes I learned to cook while on Guam) to share with him next time he’s in town (Columbus, GA). Thanks again! Missing Guam and I’ve made a few recipes here on mainland thanks to you. I am so grateful that you share your knowledge. I’m just a Texan who fell in love with Guam. Thank you again! It’s all delicious and comforting for my soul. You’re welcome! I’m glad you’ve grown to love our Island and our food. Stop by again soon. Janice & Aubrianna, looks delish! I’m gonna try it! I’m going to make this tomorrow for our Thanksgiving dinner. Do we add carrots like the photo shows & how much? I didn’t see it on your recipe instructions. Thank you! Thanks for pointing that out, Lynda! I completely missed that step! I updated my recipe to add the carrots! Happy Thanksgiving to your and your family!